The Taliban have killed more than 200 Afghan soldiers and police officers in four different areas in the last three days. More than 100 Afghan security forces have been killed in Ghazni, about 40 to 100 were killed in the Ajristan District, more than 50 were killed at a base in Faryab Province, and at least 16 were killed in the northern Baghlan Province. The US and Afghan governments have downplayed the Taliban assault on Ghazni, but local reports and witnesses claim the Taliban has taken much of the city, as the battle appears to still be raging on Monday. The Taliban have killed more than 200 Afghan soldiers and police officers in four provincial districts in the last three days, with the heaviest losses occurring in the key city of Ghazni just south of Kabul, according to The New York Times. More than 100 Afghan security forces have been killed in Ghazni, about 40 to 100 were killed in the Ajristan District, more than 50 were killed at a base in Faryab Province, and at least 16 were killed in the northern Baghlan Province, The New York Times reported. The fighting in Ghazni appeared to still be raging on Monday after the Taliban launched a heavy assault on the city on Friday, killing more than 100 Afghan soldiers and police officers since then. Afghan defence minister Tariq Shah Bahrami said Monday that 194 Taliban fighters and at least 20 civilians had also been killed,according to TOLO News, adding that 1,000 extra Afghan troops have been sent to quell the situation. “With the deployment of additional troops to the city, we have prevented the collapse of Ghazni province,” Bahrami said,according to The Washington Post. 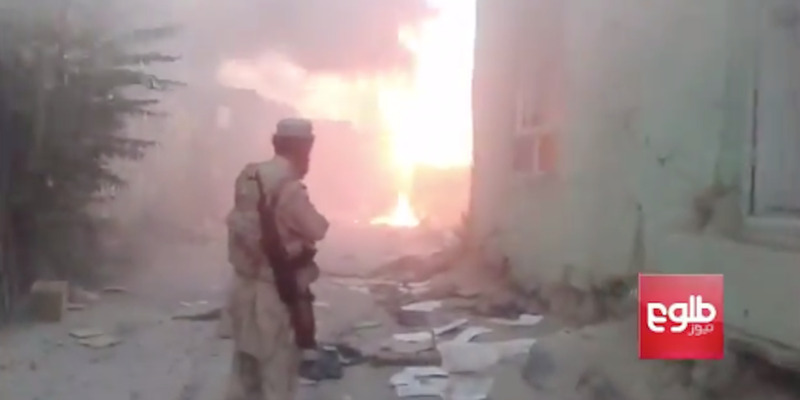 But there have been contradictory reports about how much of Ghazni the Taliban has taken. “Ghazni City remains under Afghan government control,” Lt. Col. Martin L. O’Donnell, a spokesman for Resolute Support, the NATO-led mission in Afghanistan, said Monday, adding that the situation was “relatively quiet” despite admitting the US has carried out more than a dozen airstrikes in the area since Saturday. And Mohammad Arif Shahjahan, a lawmaker from Ghazni,told CNN on Monday that the Taliban fighters still controlled several governmental buildings and had even taken the police headquarters. Videos posted on social media on Sunday even appear to show Taliban fighters strolling through the streets. “We’re running out of hospital rooms; we are using corridors and available space everywhere,” Baz Mohammad Hemat, the director of the hospital in Ghazni, told The New York Times, adding that 113 dead bodies and 142 wounded had gone through the hospital. “Bodies are lying around, they have decomposed, and no one is doing anything to evacuate them,” Nasir Ahmad Faqiri, a provincial council member, told The New York Times. Meanwhile in Ajristan District, located about 90 miles west of Ghazni, the Taliban drove two vehicles packed with explosives into an Afghan commando base on Friday, killing nearly 100 government troops, The Times reported. In the northern Faryab Province on the border of Turkmenistan, an Afghan Army base had been under attack for nearly three weeks in one provincial district when the Taliban launched a heavy assault on the base on Friday, killing more than 100 security forces, The New York Times reported. Azam was killed shortly after talking to The Times over the phone, The Times reported. These Taliban assaults are the largest since the group assaulted the capital of Farah Province in May, an event that unfolded much like the one in Ghazni, with Kabul and Resolute Support downplaying the situation, and local reports showing and saying that the Taliban took much of the city.